This strenuous hike offers a lot of the same challenges of reaching Flatiron, similar views, but doesn't require that final, steep push to the top. Nor does it have the crowds. There are a multitude of stretches along the trail up to and past Siphon Draw that have very loose footing. Take your time, try to step on solid rock when possible, and let faster hikers pass so you can go at your own speed. With visitors coming to town later this month, we wanted to come up with a challenging hike that would offer our guests a sense of accomplishment, a chance to see our house "from above", yet not that last killer ascent to Flatiron (especially for the shorter visitors in our group). We've often viewed Peak 3845 from our home and thought "why not?". We can set up the telescope for them to see where they're headed and take binos on the hike for them to see back down where they started. The hike starts out at the Siphon Draw trailhead in Lost Dutchman State Park and follows the same trail up past Siphon Draw. 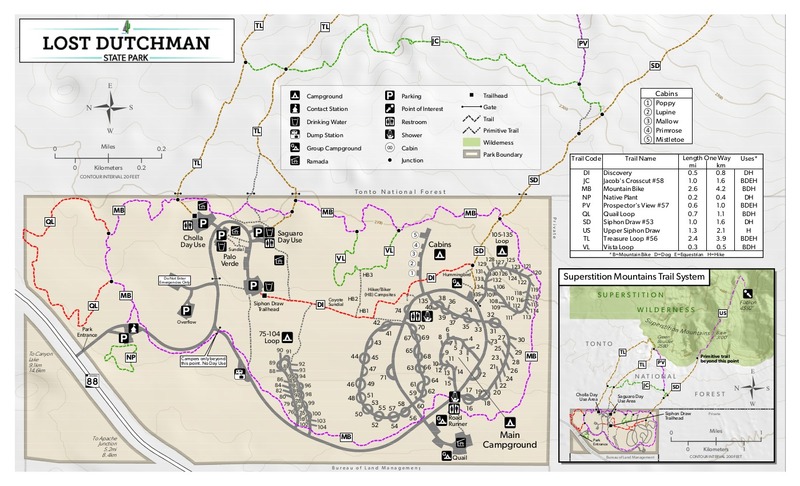 For those who haven't made that hike yet, Randal Schulhauser has posted an excellent description of the hike on the HAZ website. Please take the time to read it as it has not only a description of the hike, but also the history of the area. Also read Joe Bartels' description of hiking to the Flatiron. From the Siphon Draw basin, proceed up what I call "The Slide" (the steeply sloped somewhat smooth rock to the right of the waterfall) and then on up "The Stairs" (the same-colored rock that has narrow 'stairs' cut into it). Continue scrambling up the wash (it will start to feel like you're going up a chute) to the point where you top out and it looks like you will have to descend a bit (this is where Joe's description says "After the waterfall section, you'll top out on a mini rise."). Here you will take a hard right and deviate from the trail to Flatiron. The path to 3845 is surprisingly rather well worn and cairned fairly well. Just stay on the trail, headed now southwest, and look up to your left. That's 3845. Some light scrambling's involved, but not anything like what you just went through! The path, if you continue southwest, takes you on a spur to an outcropping that you might want to explore. The spur starts where there's a line of rock's across the path. If you go out the spur, come back to this point. If you hadn't taken the spur you will make a very hard left and start your ascent to the peak. Continue watching for cairns and you'll shortly be on the top. Find yourself a level rock for a rest, enjoy the views, take some photos, have a snack and look for the big cairn. Return the way you came. Unless you consider the pools at the bottom of the waterfall at Siphon Draw to be a water source, there is none. Carry all that you'll need and then some. 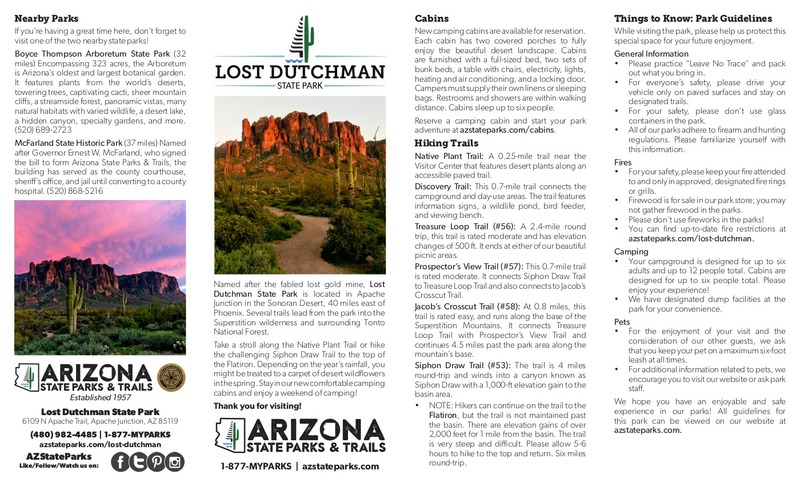 Camping is available at Lost Dutchman State Park.